The Korea Times is reporting that LG is trying to team up with other TV makers in Japan, China, and the U.S. to create an OLED alliance and boost its panel business. Right now, LG is the only major TV manufacturer introducing new OLED TVs to the U.S. market, and the report below says that Sony and Panasonic have joined the alliance. LG Display plans to team up with leading television makers in Japan and China to boost its organic light-emitting diode (OLED) panel business. "We are in talks with companies from China, Japan and the United States to create an OLED Alliance," company CEO Han Sang-beom told reporters, Monday. He did not specify details of the alliance. LG is the industry's biggest supplier of OLED panels that are used in premium televisions. It supplies components to major Chinese TV manufacturers and LG Electronics. Sony and Panasonic of Japan are new entrants that have teamed up with LG in the large-sized OLED business. Its rival Samsung Electronics is focusing on supplying small OLED panels with most of its products being used for the Galaxy handset series. To read the complete Korea Times stroy, click here. 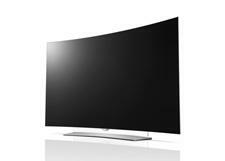 • LG Announces Pricing and Availability of New 4K OLED and LED/LCD TVs at HomeTheaterReview.com. • No New Samsung OLED TVs in 2015 at HomeTheaterReview.com.